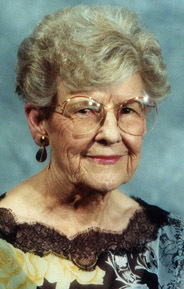 Services are scheduled for 10 a.m. Friday, March 30, at First Presbyterian Church for Edna Carper of Artesia. Carper, 103, passed away Wednesday, March 21, 2018, at her home. Fr. Maurice Geldert and Fr. Herb Robbins will officiate the services, with interment to follow at Woodbine Cemetery. Pallbearers will be grandchildren John Emery Jessee, Stanley Glen Jessee, Lindsey Nelle Stawarczik, Amy Leann Reid, Stephanie Lynn Rosa and Aaron Van Carper. Honorary pallbearers are all of her great-grandchildren. Edna was born Aug. 6, 1914, in Chugwater, Wyo., the daughter of Bertha Cowles Bassette and John Marion VanWyngarden. On Dec. 29, 1940, she married Stanley Carper and moved to Artesia. Edna received her Bachelor of Arts from the University of Wyoming in Laramie, Wyo., and taught music in Atwood, Colo., and Tularosa. She was organist for St. Paul’s Episcopal Church for 54 years. She also organized the Compassionate Ministry there. She participated as a leader for Girl Scouts and Boy Scouts for 10 years, was a member of the Artesia Arts Council Chorale, and was organizer of the Medieval Feast. Edna belonged to the Lasses Ladies A Cappella Singing Society and the Six Guitars, and was part of the Sentimental Journey with Jess Briggs and Tony King. She was a member of Chapter J, P.E.O. Sisterhood. Survivors include daughters Claire Jessee and husband Pete of Bogata, Texas, and Janice Bonds and husband Joe Raley of Duran, N.M.; son Stanley Roger Carper and wife Becky of Artesia; grandchildren John Emery Jessee, Stanley Glen Jessee and wife Donna, Lindsey Nelle Stawarczik and husband Wesley, Amy Leann Reid and husband Jason, Stephanie Lynn Rosa and husband Michael, and Aaron Carper; great-grandchildren Jessica Rae Kirkland and husband Kyle, Stanley Reese Jessee, Trevor Lee Jessee and wife Tristen, Madison McKenna Stawarczik, Morgan Michael Stawarczik, Braiden Duane Reid, Tate Dale Reid, Andon James Reid, Deigen Kendrick Rosa, Taylan Rosa and Havrly Rosa; and great-great-grandchild Caroline Grace Kirkland. She was preceded in death by her husband, Stanley Carper, on Sept. 5, 1969; her parents; and a great-grandson, John Layton Reid.